You are browsing the archive for The Sun. It’s a double for Pete Nash in a return to The Sun with his cartoon Striker. The 20-year run of Warbury Warriors football stories in the paper was broken in 2009 after a contract bust-up. 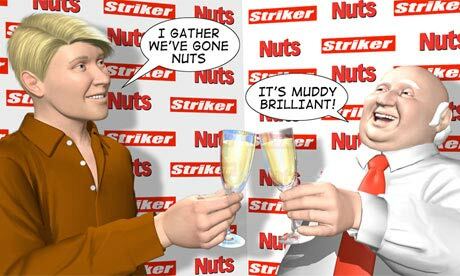 The artist then took his star player Nick Jarvis and the team for a spell on loan at Nuts. In his first spell at The Sun, Nash grew the stories from modest beginnings into one of the most popular features in the paper. As the printed output grew he developed a team of computer graphics artists to create the daily narratives. There was also an attempt to launch a standalone magazine, above, between 2003-2005. You can read more about Striker’s business relationship with the paper here. In the new storyline for the return to the paper reports have it that “his [Jarvis’s] beloved club have been given three weeks to pay a £9million tax bill or face winding-up proceedings”. To spare you lots of pictures of cartoonists bending over tables and displaying their bald spots – with the exception of the Big Girls Drawers team, of course! – we present a selection of details from the seven banners in the Battle of the Cartoonists in the V&A’s Raphael Room. The Private Eye team, captained by the non-playing Tony Rushton, emerged victorious once again. Before the Battle, Rosie Brooks from the Big Girls Drawers team, who is also a member of Procartoonists.org, appeared on BBC Radio London to talk about The Big Draw and cartooning in general. You can hear it here. The Telegraph team of Patrick Blower, Charles Peattie, Matthew Buck and John Springs took on "The Conversion of the Proconsul"
The Sun team must be congratulated for getting by with just three cartoonists, compared to, say, the Reader’s Digest with five. The Battle of the Cartoonists is nothing if not an uneven playing field. Procartoonists.org member Clive Goddard has been drawing “Sunday Smile”, a cartoon panel with a historical theme, above, for the Sun on Sunday since it launched earlier this year, above. 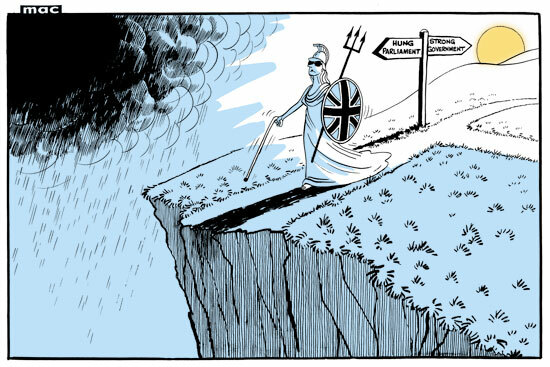 Editorial cartoons in the paper are regularly provided by Steve Bright, Andy Davey and Gary Barker. Click here for an archive of their cartoons. So if you see a cartoon in The Sun, the chances are it was the Procartoonists wot done it. Golf’s man of the moment Rory McIlroy added a unique cartoon memory to his recent US Open victory. You can find the classic handover of artwork photograph in this story from The Sun. 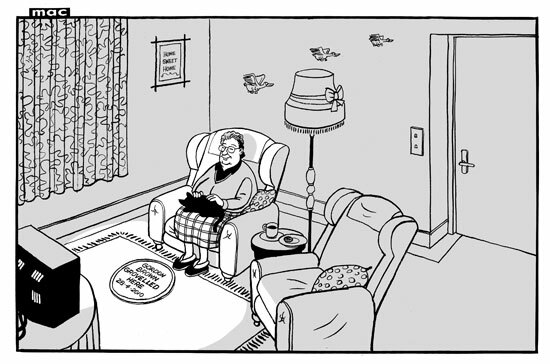 Bloghorn hat tips PCO cartoonist Andy Davey.